← A beautiful Valentines heart full of roses! 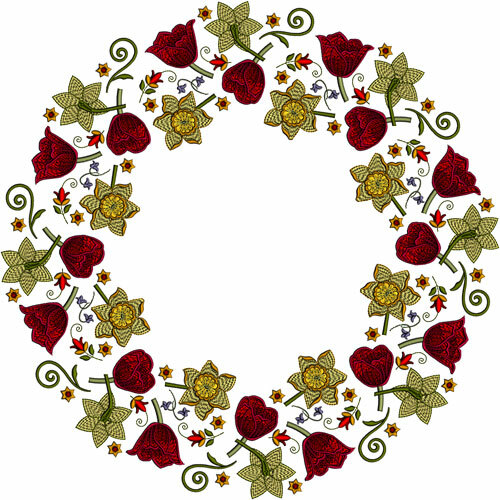 There is nothing more delightful than a perfectly embroidered wreath in the centre of a table with an ornament or vase standing in the middle, but many of us may find the prospect rather daunting unless it is embroidered out in one hooping. In preparing the last design set in the Anastasia’s Spring I thought a lovely wreath featuring the beautiful daffodils and tulips in this collection would be a magnificent conclusion. Due to the detail that these flowers contain it was not possible to prepare a decent size wreath for one hooping. I got carried away creating the perfect segment that would multiply upon itself and be a wonderful wreath of spring flowers for an Easter tablecloth or similar project, not paying any attention to its exact size. Hope you like it! Then I selected the whole design to discover that it would need a total of three hoopings! There was a challenge for me in preparing it and for you too, but it is sometimes good to aim high to increase your skills and confidence, so here goes. Although I would use my Outline alignment stitches to help the placement of the three designs I felt that something else was required. After much deliberation I settled on an extra outline, the inner circle which the design forms which could be used to help align the 3 designs perfectly. 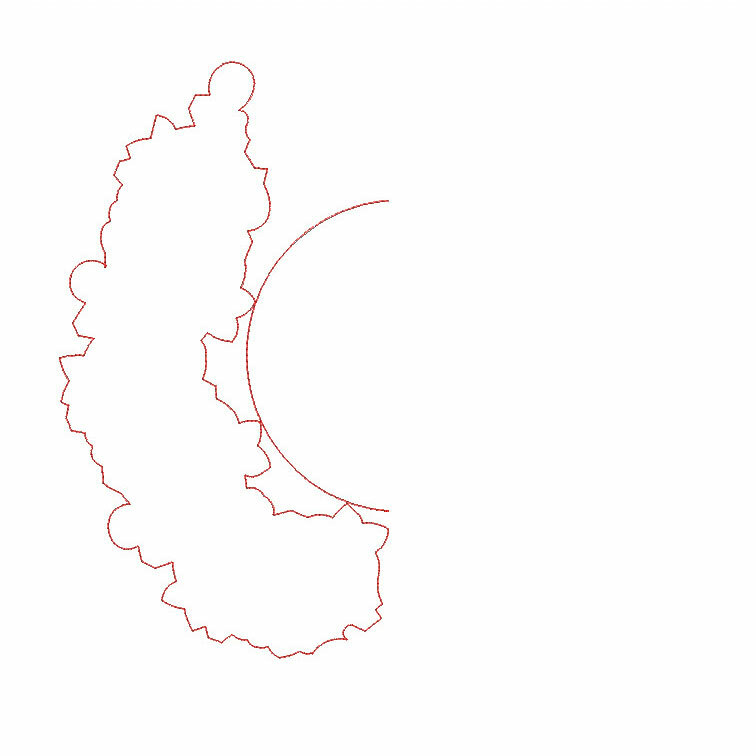 This circle can be stitched out on your stabiliser or just drawn. It needs to be 6″ (153 mm) diameter. Each design will include the relevant section of this circle. Here you see the OAS for GFE-ATP-4-10a and the partial circle. This is the first segment of the wreath when it has been embroidered. 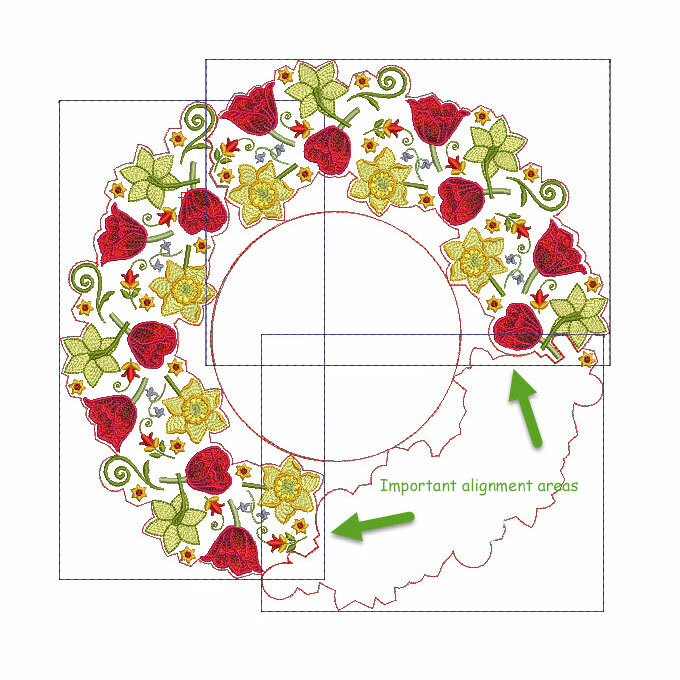 The the OAS for the second design are stitched on your stabiliser so you can place your fabric in the correct place for the second segment of the wreath. Lastly this diagram shows the OAS for the third design and the important alignment areas. Here is the finished wreath! If you have not used my Outline alignment stitches before I suggest experimenting with them on a smaller project before attempting this one. For your information the three designs combined have just over 170,000 stitches. I will be releasing the set in the next few days. This entry was posted in Embroidery projects, New Designs and tagged Easter, Placement of designs, Wreath. Bookmark the permalink. I have a 14 X 14 hoop. What is this design size overall. 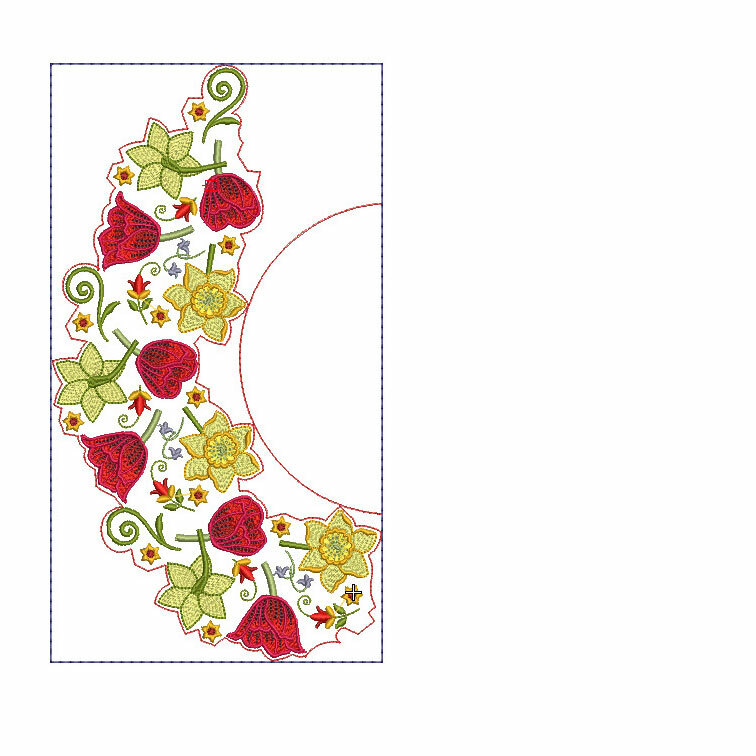 Maybe I can embroider it in two hoopings. 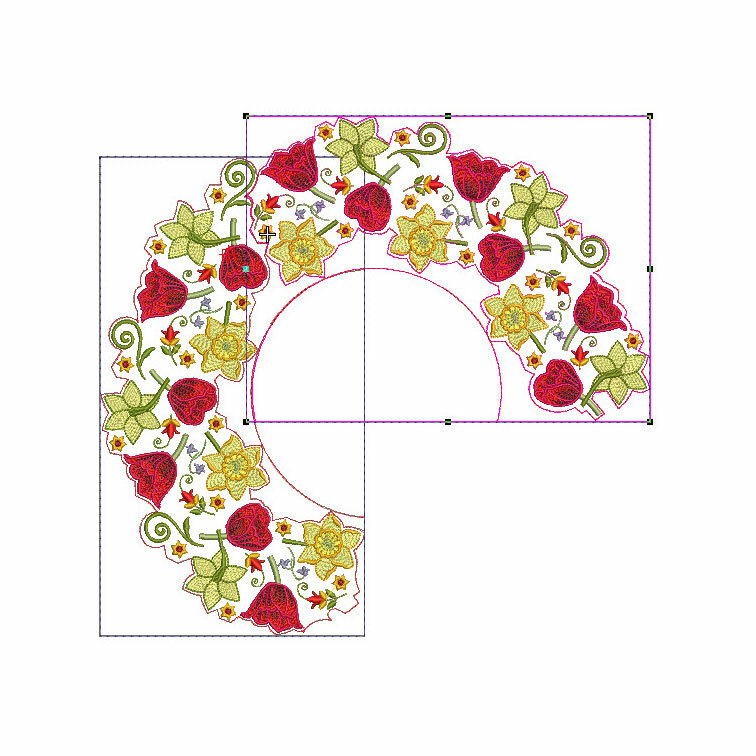 The finished design is under 14″ square so you will probably be able to do it in a couple of hoopings. 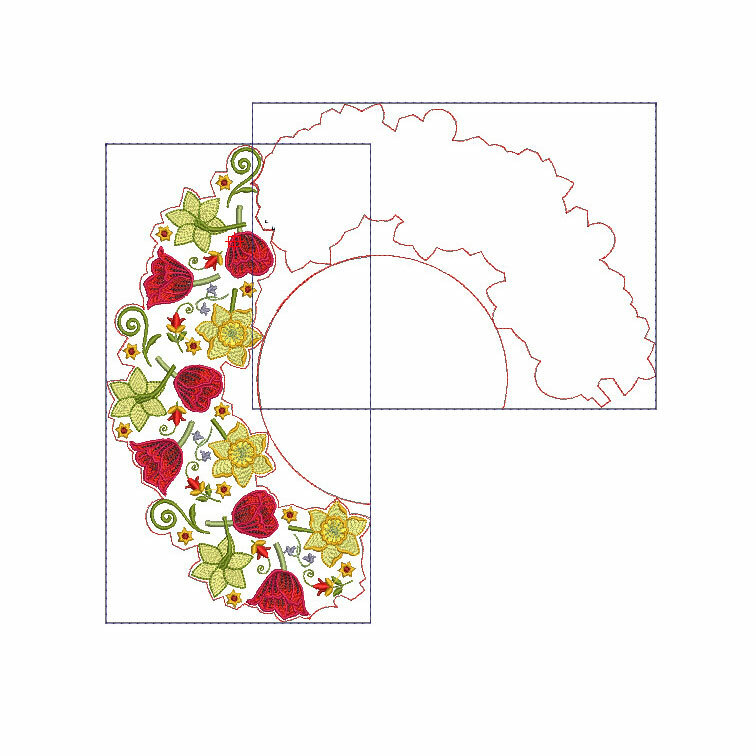 As well as the 3 parts for the wreath there will be a design of the whole wreath for those with commercial machines. Customers may be able to split it for Majestic and Grand Dream hoops as there are gaps in the wreath where the necessary splitting can be done. I have tried to split this design for Majestic and Grand Dream hoops but it is impossible to do without splitting through flowers or stems. Even when I rotated the design I could not find any where to do this. Sorry about that.